How far would you travel for a really special steak? I faced this question when I heard that a new South American steak house had opened in Prague. But it is barely in Prague. 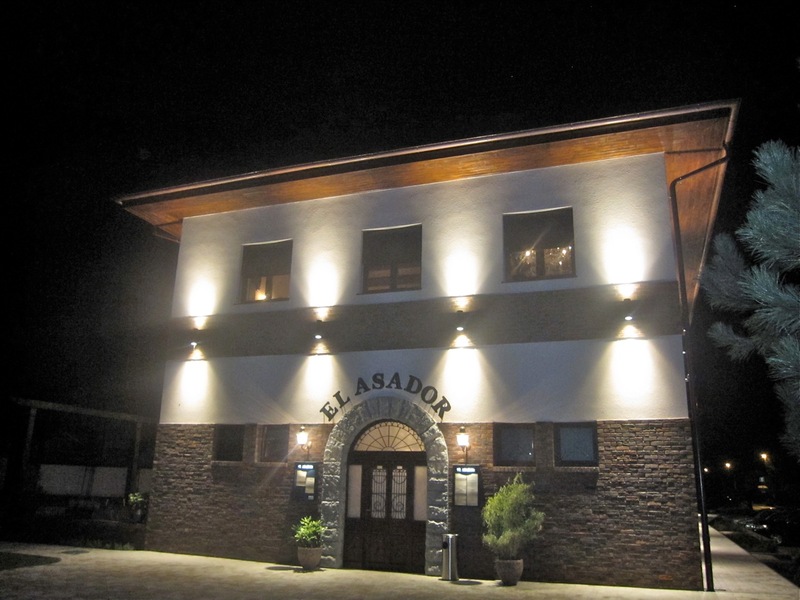 El Asador is in a small village on the eastern outskirts, near Průhonice. Still, my quixotic quest for quality beef has few limits. 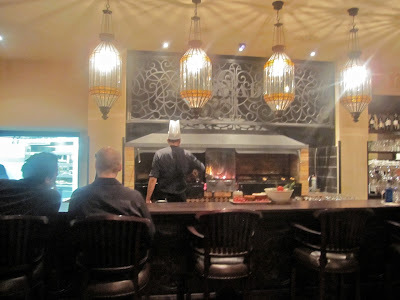 I am always searching for cuts to add to my Prague steak list. Getting there meant a drive of about 30 minutes from the center, unless you want to take the C line metro to Opatov and then bus 326 or 327 to the stop at Hrnčíře. I drove, but even my GPS system sent me down two dead ends into the surrounding farmland before I found the restaurant. In this tiny village, a shiny new building houses this steak house. 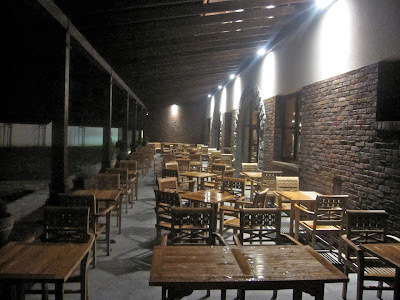 There's a big patio around the back that must be fine for dining al fresco, weather permitting. On this rainy night, it did not permit. It could be fun to sit out there for their Sunday barbecue brunch. 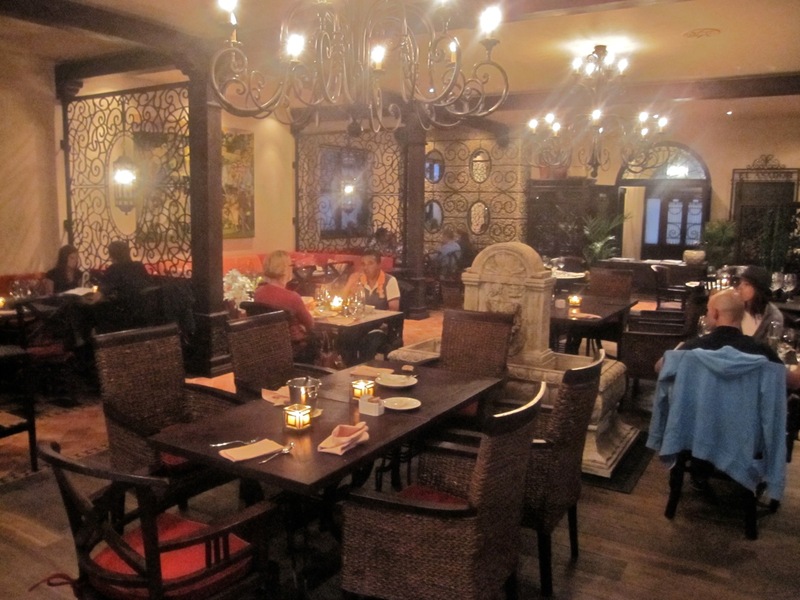 They have a special grill menu and buffet that day for 580 CZK per person. My first glimpse of the interior impressed me. It might not be to everyone's taste, but thought it made a strong statement that this is a high-end place that takes its steaks seriously. 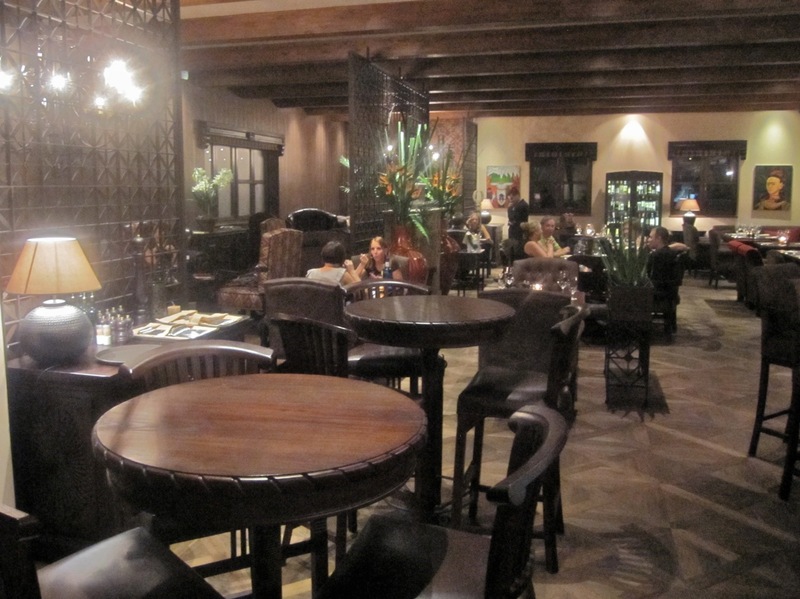 It is furnished with heavy wooden and tiled tables, custom wrought iron work, and dark-stained hard wood flooring. At the back end is specially designed wood-fired grill with a chef cooking the meats in full view. It's all a little over the top, but not too far. I think it is certainly more appealing than the Disney-like setting at La Casa Argentina. 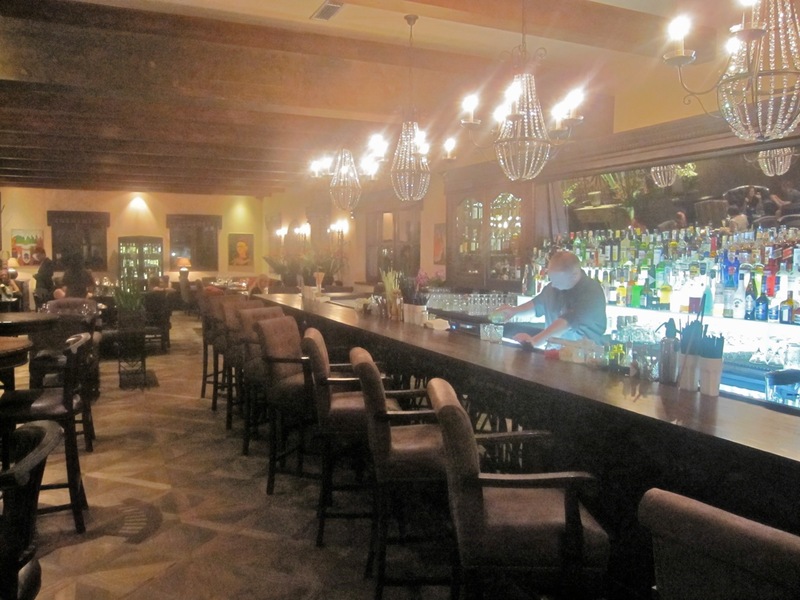 A climb up the staircase takes you to the bar area that occupies the entire upper level. The long bar itself stretches almost the length of the room. The wood-beamed ceiling stretches out above an inlaid wood floor and comfy-looking overstuffed chairs. I daresay it is even nicer than the restaurant downstairs. This made it all the more heartbreaking that I had to drive my car to get to the restaurant. 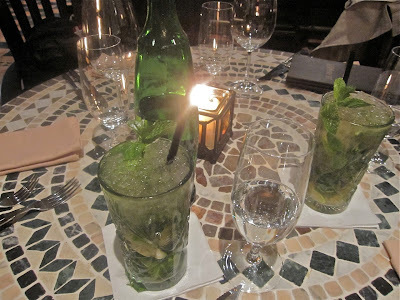 In solidarity, my friend joined me in ordering virgin mojitos (100 CZK). We also had a big bottle of Mattoni mineral water (90 CZK). 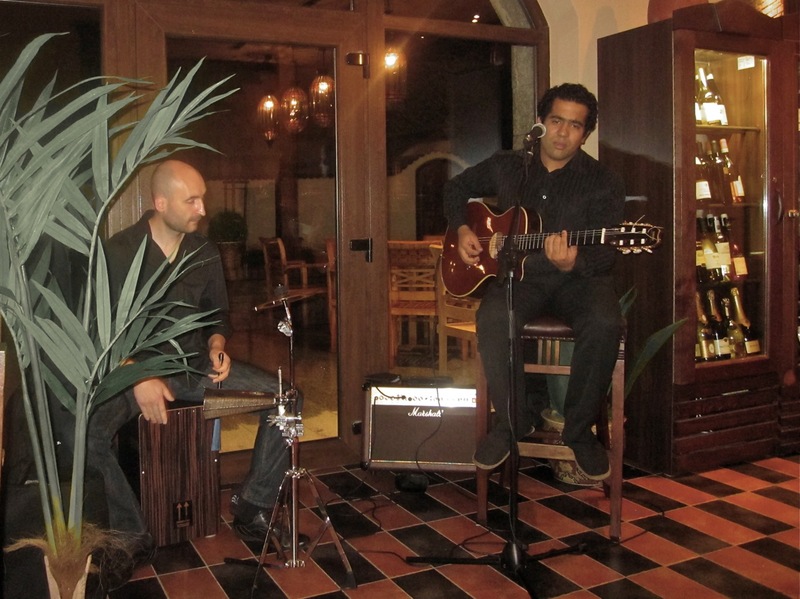 On this Saturday night, there was live music. 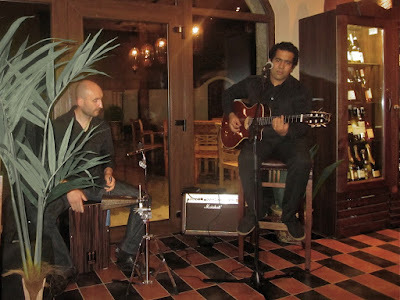 A guitar player and singer, along with a percussionist, covered a variety of Latin classics. They performed them well, which added to the pleasant atmosphere. We each ordered starters. My friend had the selection of seafood tapas (245 CZK). This sounded good on paper, but the reality brought some real regrets. The calamari was fresh, not frozen, and it was pretty good with lemon squeezed on it. That's the good news. Maybe it's an American thing, but I thought it could use a dipping sauce. 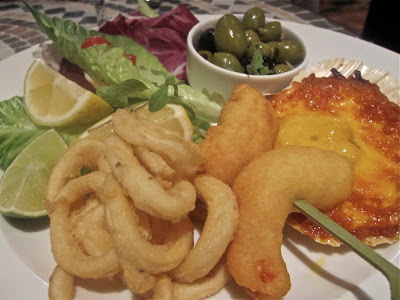 The menu said the tiger prawns were cooked "tempura" style. The medium-sized shrimp were fine, but this was not any tempura I am familiar with. The thick, cake-like batter made the prawns taste like they were encased in a dinner roll. There was a bowl of fairly ordinary olives. Finally, there was the gratinated scallop. While I expected some cheese, I didn't think there would be an orange sea of what looked like molten cheddar. It completely smothered the delicate scallop. Luckily, the cheese was easy to scrape away to reveal a perfectly seared mollusk that was much more enjoyable on its own. I had the ceviche de pescado (170 CZK). 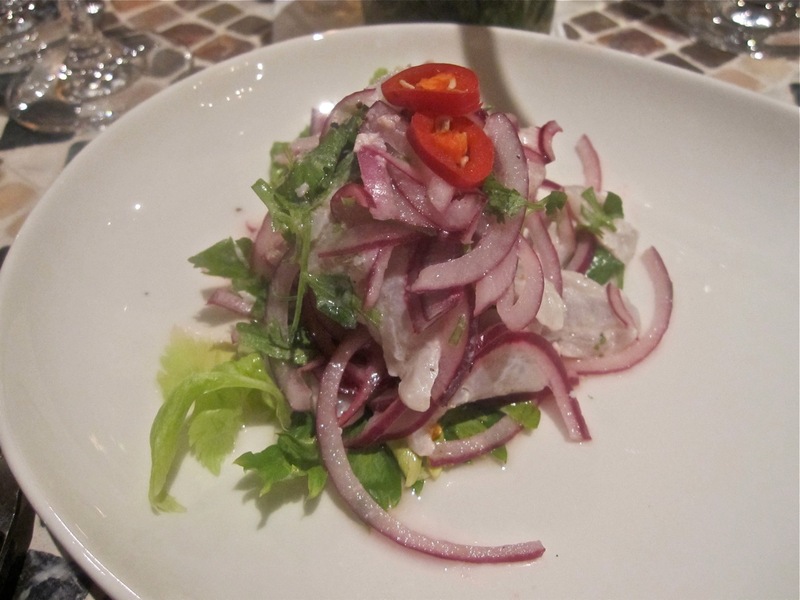 The sea bream or dorade was marinated in lots of lime juice and mixed with cilantro and chilies. Then it was buried under a pile of chopped red onion. The chunks of clean-tasting fish were nice enough, but we thought the onion overwhelmed it. I scraped most of them to the side. The waitress came by to clear the plates and asked how everything was. I mentioned that I thought there were too many onions in the ceviche. She said she was sorry, and shortly afterward, the manager came by. "I've heard you had a problem with the onions in the ceviche," he said. "It's really not a big deal. It was just too much for me." 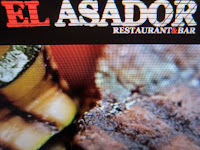 "I can assure you, our chef is from South America and this is an authentic recipe," he informed me. "But if you like, we can prepare it with less onion." I told him that would not be necessary, but I didn't necessarily accept the indirect word of his expert. Later, I consulted my own source, a man very familiar with this recipe, which is actually Peruvian, and who also tried this dish at this restaurant. He told me that while the manager was technically correct, the authentic version uses much milder and sweeter red onions, making them less dominating. So we were both right. Except that the strong, sharp onions were, indeed, too strong and not right for the dish. But enough of this pedantry over the preliminaries. It gets a lot better from here on out. I had to have a grilled steak. I got the 250 gram Aberdeen Angus rib eye from Argentina (300 CZK). I will state now and for the record that this was the best steak I have had in this country. Each bite of the tender, charred, smoky meat was pure pleasure. You have to like your rib eyes on the fatty side, and I do. It was better than many steaks I've had in the USA. I was amazed. 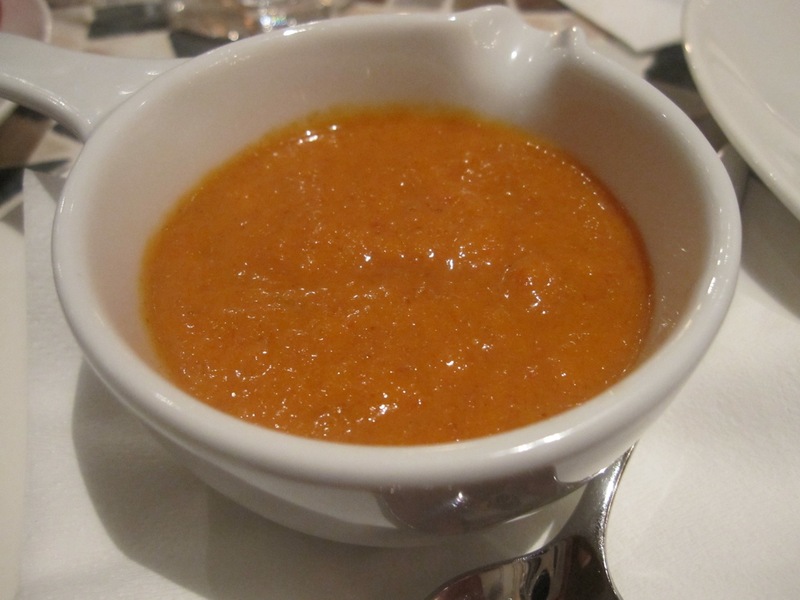 On the side, I ordered the Isleña sauce, a quite spicy, creamy, chili pepper mix (38 CZK). It was hardly necessary. It would be a shame to let much interfere with the fantastic flavor of the beef. The chef also does excellent grilled vegetables (55 CZK). 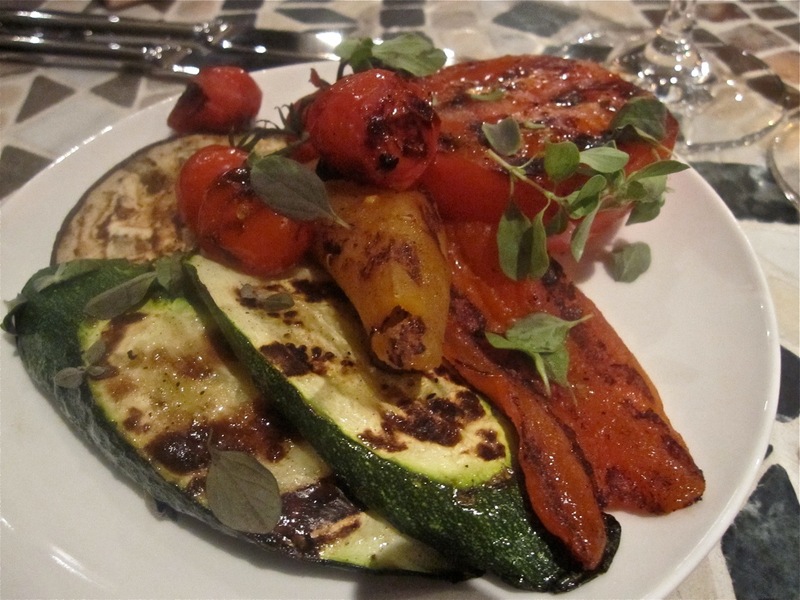 The zucchini, tomato, aubergine, and peppers picked up flavor from the grill as well as the particular perfume of fresh thyme. 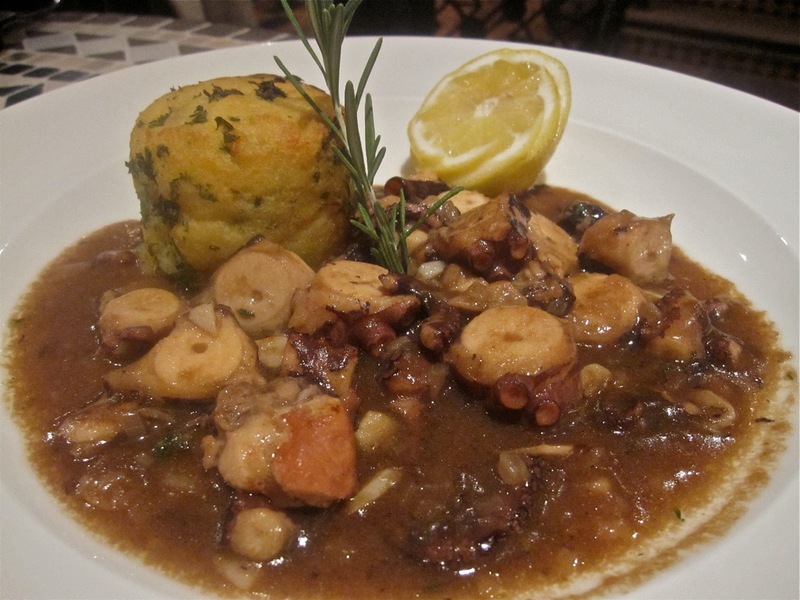 My friend had the octopus cooked in Sauvignon Blanc (299 CZK). We found this highly enjoyable. The strong flavor of the wine came through the sauce sweetened with honey and seasoned with thyme. The sliced tentacles were fresh and tender. The gratinated mashed potatoes on the side had been placed under some kind of heat, which dried out its outer layer, but otherwise tasted fine. We had gone from the sad to the sublime. We decided to try our luck with dessert. My friend ordered the Nube de los Andes (95 CZK). 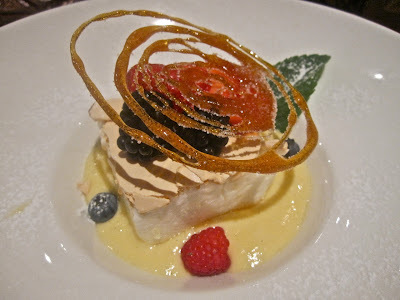 It was described as a "chilled mousse with forest berries and egg yolk cream." 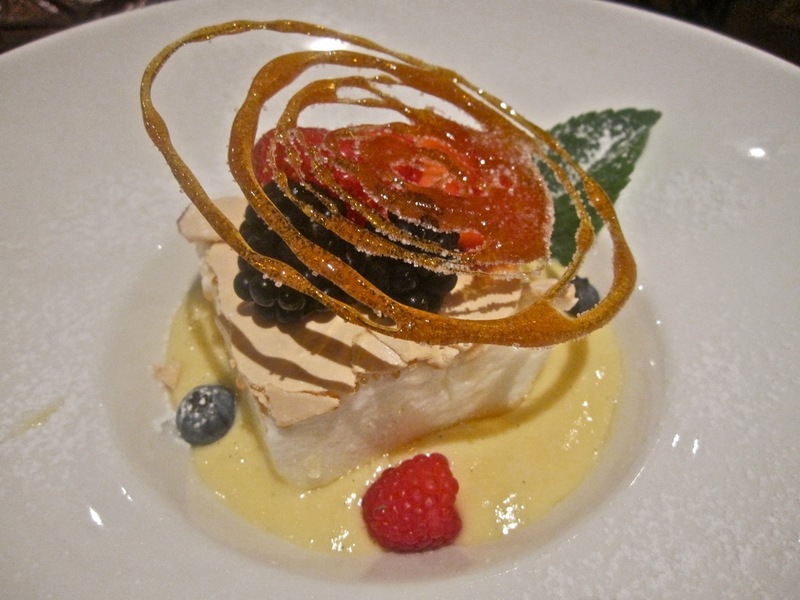 I'd describe it as an ethereal meringue sitting on top of uncaramelized crème brûlée with blackberries, raspberries, and blueberries. 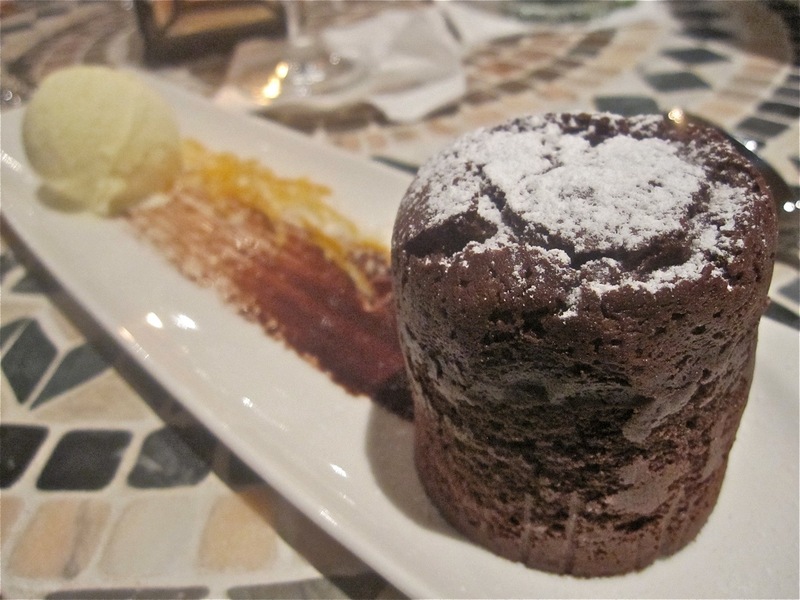 We would both characterize it as an unusually delicious and different dessert. The spun sugar on top actually made it more like a crème brûlée but with some great added twists. Yum. 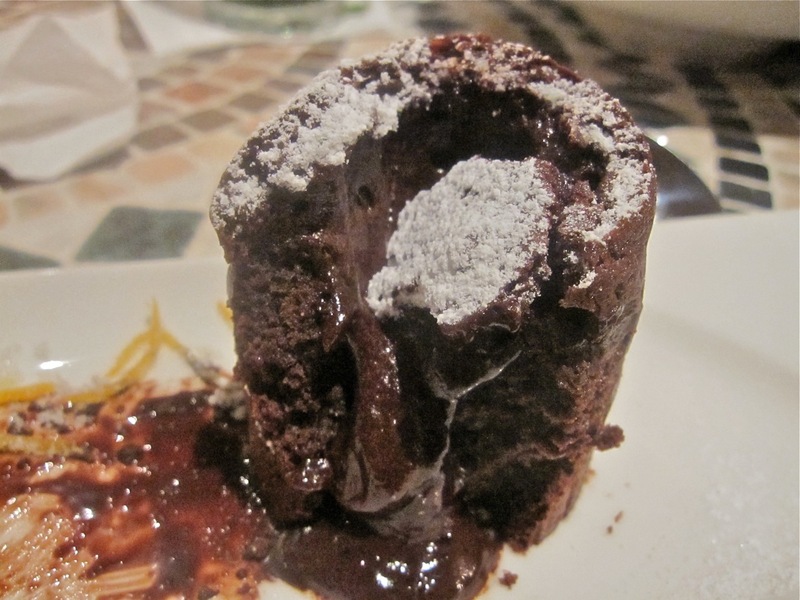 Predictably, I had the Chocolate Volcano, otherwise know as chocolate fondant (135 CZK). This takes time because it has to be baked to order. But it was worth waiting for. It was a particularly good version with an intense hit of cocoa. However, the vanilla ice cream tasted cheap and was not a worthy partner. A scoop of Häagen-Dazs would have done a far better job. Someone spent super serious money building one of the Czech Republic's best South American steakhouses in a wealthy but sparsely populated suburb of Prague. Whether that was a wise move, I cannot say. But I seriously wish there was an El Asador in the center of of the city. I wish I didn't have to drive and forsake alcohol to partake. 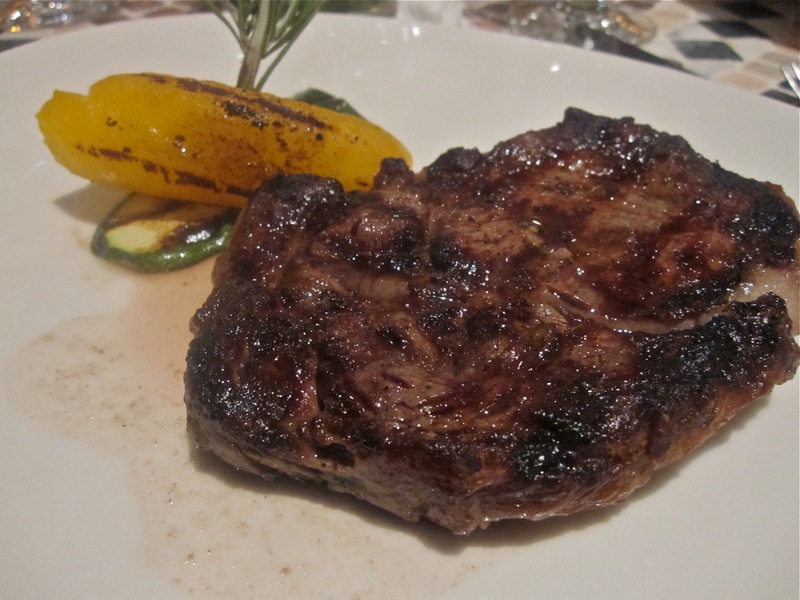 But it is a special steak that is worth a special trip, so I will certainly drive out there again to go and eat it.